This King set appears to have been released (according to the Wiki copy below) right about the time Hope quit the music business. So, depending on the circumstances, King may have had to scramble to find an image that they could use on the cover. The hand-tinted photo image/cover is graphically dated for a 1961 release, but nonetheless, pretty darn cool looking. The set itself, as the Billboard review suggests, is "expressive" in that Hope manages to put his special "slow burn" or "jazz twist" on every song. He must have put on a good show. The set receives 3 Stars from Billboard - January 30, 1961: Lynn Hope's sultry sax is featured here on a group of expressive instrumentals of originals and standards. 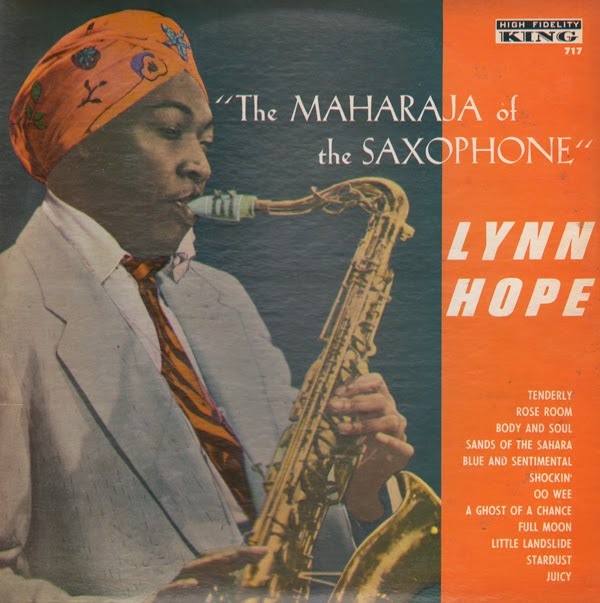 From Hope's Wiki page: Lynn Hope (September 26, 1926 - February 24, 1993) was an American Jazz and Blues tenor saxophonist noted for his outlandish dress style in the 1950s (he would often wear a fez or turban.) His most prolific period for recording was from 1951 to 1957 for Aladdin Records. Hope, who later converted to Islam and changed his name to El Hajj Abdullah Rasheed Ahmad, appears to have been inactive musically from 1960 until his death. Very interesting post. The guy could play. Why did he leave the musical scene? Religion? How did he earn his living?